Since bulbs of Amaryllis belladonna first arrived in Europe at the beginning of the eighteenth century its pale-pink trumpet-flowers have been admired, painted, photographed and written about. Very few of us, though, can successfully grow it. A need for a fertile, but well drained soil, coupled with a hot summer, a wet spring and a dry winter makes for a fussy plant. In Britain, its only gardeners in Cornwall, the west coast of Ireland and parts of south-west Scotland have any hope of growing it well. 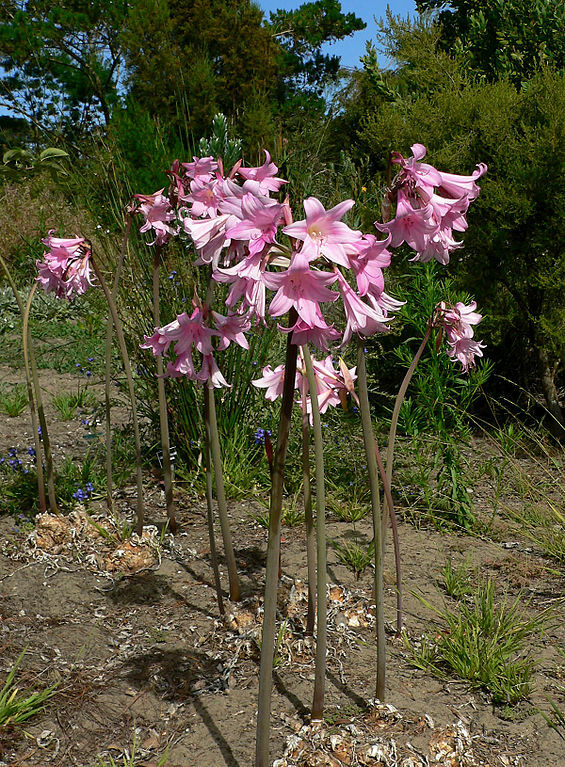 Fortunately Amaryllis belladonna is very promiscuous and hybridises with other genera. The resulting offspring, while not trouble-free, are much better adapted to British gardens. Mating with the Jersery Lily, Nerine, has produced Amarines and an encounter with Brunsvigia has resulted in Amarygias. The most rewarding of these intergeneric hybrids to grow is Amarcrinum, a cross between Amaryllis belladonna and Crinum moorei. It is rare for children to inherit only the best traits of their parents but Amarcrinum has the best qualities of each and none of their shortcomings. The flowers that dangle from bare stems (whence the common name in the United States of Naked Ladies) make Amaryllis belladonna a startling sight that can be difficult to incorporate into the garden. Amarcrinum is much more floriferous and retains its foliage while flowering. The fresh apple-green leaves have the effect of softening the thick stems, making the plant sit more easily among shrubs and herbaceous plants than does Amaryllis belladonna. Anyone who grows Crinums will know that while their scented flowers are delightful, their straggly leaves quickly turn ragged and ugly, and are most unwelcome. Amarcrinum keep the delicate scent of the Crinum but have lost the tatty foliage. On established plants each stem produces between ten and fifteen flowers over a two-week period. Taxonomists and botanists often disagree on the correct naming of hybrids. Amarcrinum has had a variety of names but the accepted reference of the RHS’s ‘Plant Finder’ currently has its correct name as x Amarcrinum memoria-corsii. You may also find it under its former name of Crinodonna. 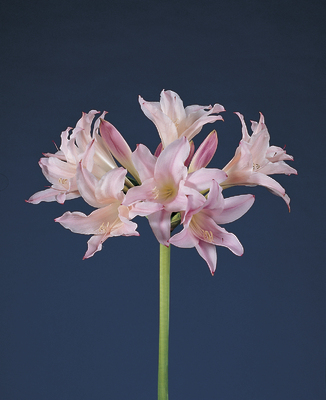 A form known as Amarcrinum memoria-corsii ‘Howardii’ is widely available. Its flowers are reputed to be a darker pink but to my eye the difference in flower colour is negligible. Whatever the correct name, Amarcrinums are wonderful plants whose late flowering bring zing to the garden at this time of year. With the garden clothed in the golden and russet hues of autumn, the bright pink flowers of Amacrinum sing out. Amid the decay and fading foliage of the season here is a plant that harks back to the razzamatazz of high summer, to warm evenings and to scent-filled borders. The bulbs should be planted about 4 inches deep in a rich, free-draining soil. They are greedy plants, so dig over the area you are planting them in, incorporating as much compost as you can. Don’t be tempted to just fork a little compost into the planting hole. The bulbs are long-lived and will form large clumps; enriching the soil around them will help them spread. If your soil is heavy add fine-grade horticultural grit. Amarcrinum grow well in wide, deep pots but will need occasional feeding with a liquid fertiliser in the spring. For the bulb to flower well the compost should be kept moist during the spring and summer. In cold winters bulbs grown in pots are susceptible to freezing so are best stored in a greenhouse after flowering. Make sure that the compost is kept dry during winter, but never allowed to dry out completely. New plants can be made by removing the offsets that grow around the parent bulb. However, Amarcrinum dislike being disturbed and will sulk if they are dug up, refusing to flower for a year after being replanted.